Although it may not seem this way, January is the perfect time to cast on for a spring cardigan. While spring may seem to be a far off dream at the moment (it’s zero degrees out as I write this) it really is coming and it’s nice to finish a garment in time for the season it’s intended for. 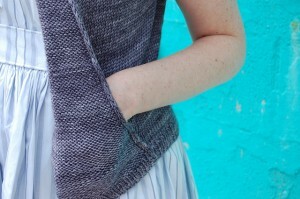 While perusing the many cardigan patterns out there I was immediately drawn to the more wintry items but practicality won out and I’m plotting a Goodale Cardigan. The greatness of this cardigan is all in the details. How great is that cute pocket?! The enclosure at the top is also the perfect platform for a couple of great buttons. It’s the perfect cardigan for me and my darling new knitter Emily is casting on one for herself as well. She will be working in the ever popular Madelinetosh DK in the colourway Tart. It’s a little thicker than the recommended gauge but I think it’ll work out just fine. I, on the other hand, have yet to choose the perfect sport weight to work in. I have always enjoyed the softness and range of colour in the Blue Sky Alpacas Sport, but there is also the stunning Rowan Lima to consider. So many options, so little time! This entry was posted on Thursday, January 12th, 2012 at 11:17 pm	and is filed under Uncategorized. You can follow any responses to this entry through the RSS 2.0 feed. Both comments and pings are currently closed. It’s lovely, and it’s now added to my knit list. Thanks!